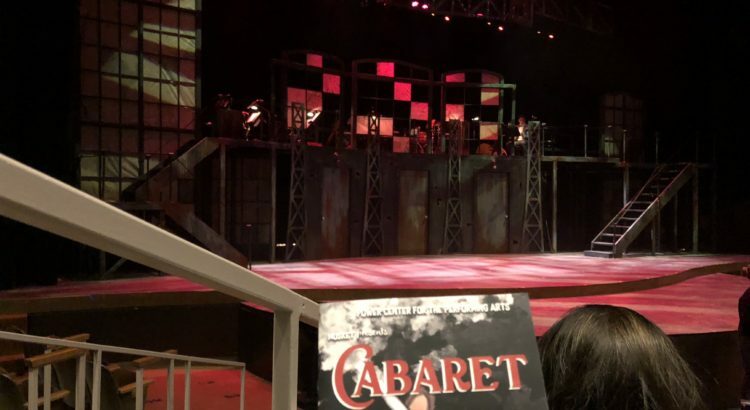 Let me just say: I was not expecting to walk out of Cabaret as effected by it as I was. Now, I’ve been known to be dramatic, but I don’t lie when I say that an hour after the show had ended, my heart was still racing. Director Isabel Olson’s vision for this production was realized at its absolute full potential for this show. I have to be honest- I didn’t understand or even really like this show when I saw the Liza Minelli movie a few years ago. But seeing it today, I can’t shake its lingering message and its incredible presentation. As the show started, Wilson Plonk as the Emcee, a colorful character lingering somewhere between masculine and feminine merely had to walk on stage for the crowd to go wild. He continued to entrance the audience, lingering like a ghost throughout the plot, always stepping in for an amusing song. As the show progresses, these numbers never become less shocking, but do become more poignant in their messages. It’s comical to watch the character dance around the stage with a Gorilla and sing about the world not understanding their love, until he says, “if you could see her the way I do, she wouldn’t look Jewish at all”. The whole cast put forward an incredible performance. The minute Caroline Glazier started singing as Sally Bowles, I was reminded of Sutton Foster, in her easily poised stage presence and her confident voice. Samantha Buyers as Fraulein Schneider brought to the stage her gentle energy, loveable spirit and one of those classy, brassy voices reminiscent of the smoothest old-timey jazz. Casey Board as Clifford Bradshaw was extremely charismatic- you could really see him as the American golden-boy novelist caught in the middle of what quickly becomes a sort of nightmare. Aaron Robinson as Herr Schultz was so loveable and the most adorable old man. And let’s not forget the Kit Kat Boys and Girls- who carried us through the show with their sultry and superb song and dance- their talent was tantalizing. The band, also, struck literal chords, beautifully bringing this story to life from their perch above the action. The chemistry between characters was electric in this show, undeniable. From the tender, tentative love turned bittersweet between the older Fraulein Schneider and Herr Schultz to the chaotic and heartbreaking affair of Sally and Cliff, these couples pulled at our heartstrings in ways any audience member could understand. The progression of the show was sneaky as the whole first act had the air of something fun (but not for the faint of heart). The new-ness of Berlin and budding romances abounded, surrounded by some Kit Kat Klub numbers, just for good measure. It wasn’t until the closing number of Act I that we hit the first dissonant chord that would grow to become cacophonous after intermission. Act II brought with it sad scenes that you couldn’t clap after and sad scenes that you couldn’t not clap after, as the cast portrayed beautifully their characters’ growing unease about the political and personal climate surrounding them. And the cabaret really turns out to be an act, a distraction from the storm brewing in the background. And it creeps up on you until the comedy and the callous tone turn sour in your mouth. This unease reached its chilling climax throughout the last few minutes of the show, as each and every character stood on stage, speaking words that defined them in their tumultuous time- words of complacency, of denial, of resignation- portraying the traits that we all so often are guilty of enacting in our own time of unrest. It was striking when the band disappeared at the end of the show, a group of people that had set the tone for the whole production- suddenly gone in a way that highlighted the fact that we hadn’t even noticed their departure. And the fantastic work of the set, lights, and costume crew played into the wow factor as the shedding of the Emcee’s coat revealed the striped pajamas reminiscent of those worn in concentration camps and the bright flashes of light mimicking gunfire, electric shock, or some other horror elicited literal gasps from the audience. And then, from the darkness, the ghost light flickered on. And it was haunting. In her director’s note, Olson mentioned this light- it’s tradition as a light for ghosts to play upon the stage after a show has ended and a safe beacon for the actors to return. It left me wondering- what should I take from this? I cannot know what I was supposed to take from it- I only know what I did. As the show ends, we know as audience members that in history, one of the world’s darkest times comes next. Despite the hopeless feeling that this knowledge imparts upon us, the light of these performers and the light of the performer’s they were portraying, is left behind- and it matters. It lingers, it lights the way for whatever comes next. After this show closes, the light will continue just as it would beyond where the writer ends this story. It is used to rebuild, it is taken up by the next to inhabit the stage, it continues to be a safe space, despite whatever else goes on in the world outside the theatre. The light remains in the darkest of times. Each and every member of this production brought that light to life today- and this reviewer was honored and moved to bear witness to this piece of art because of it. Bravo.